45 Years Ago, Armstrong Took His 'One Small Step' : The Two-Way On July 20, 1969, Apollo 11's Lunar Module, Eagle, touched down in the moon's Sea of Tranquility, marking humankind's first journey to another world. 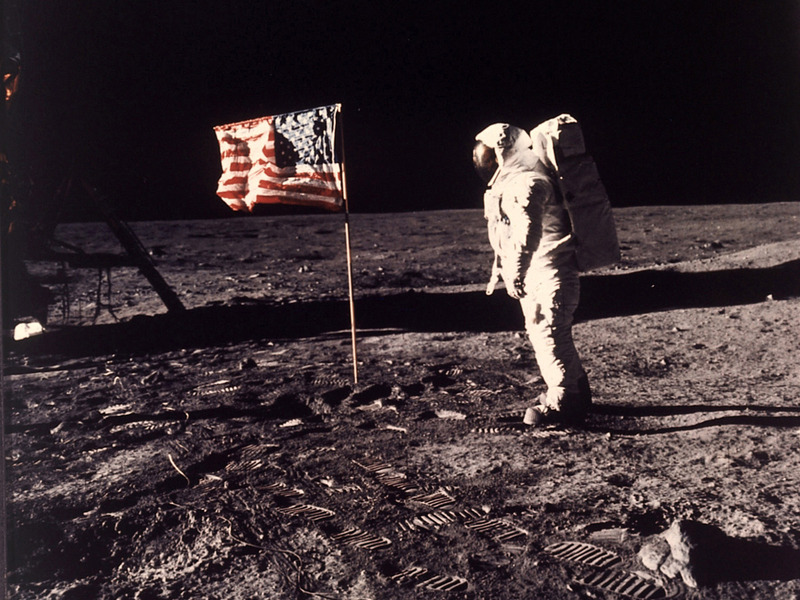 Astronaut Edwin E. "Buzz" Aldrin Jr. posing for a photograph beside the U.S. flag deployed on the moon during the Apollo 11 mission, 45 years ago. Forty-five years ago today, in arguably the greatest technological feat of the 20th Century, two Americans stepped off the ladder of their small landing craft and walked on the surface of the moon. The first of them, Neil Armstrong, 38, of Wapakoneta, Ohio, pronounced his accomplishment "one small step for [a] man; one giant leap for mankind." The second, 39-year-old New Jersey native Edwin "Buzz" Aldrin, Jr., described what he saw as "magnificent desolation." 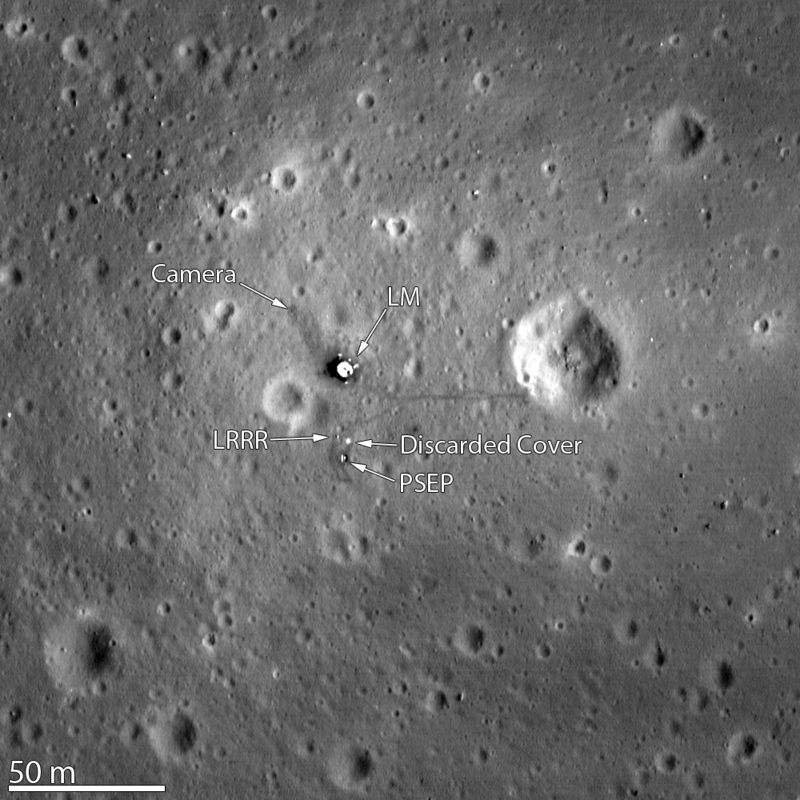 NASA image taken in 2012 by the Lunar Reconnaissance Orbiter (LRO) shows astronauts' footprints and equipment left on the moon by Apollo 11. As the pair bounded across the lunar landscape, planting an American flag, setting up experiments, and collecting soil and rocks, astronaut Michael Collins remained in orbit preparing for the crucial "lunar orbit rendezvous" that would get them back home. The famous moon walk was captured on a crude television camera and beamed live to people back on Earth. "The whole world stopped to watch what was taking place," space historian Roger Launius, assistant director of collections and curatorial affairs at the Smithsonian's National Air and Space Museum, told Space.com. "I think it would not be an overstatement to say that." But, as Aldrin tells NPR in an interview on Weekend Edition Saturday, the Lunar Module Eagle came very close to running out of fuel on its descent. "When we got down to about 100 feet, a fuel quantity light came on" indicating 60 seconds before they ran out. "I was getting a little apprehensive," Aldrin says. "But of course, I didn't want to disturb my commander [Armstrong] to the left because he was looking out and manually controlling things. As they hovered just 10 feet above the surface, the crew in the LM had only 30 seconds left. "And we touched down. And soon as that happens, I see a light on the instrument panel. And I say 'contact light' - because Neil is looking out the window - and then engine stop," Aldrin says. "And Neil says 'Houston, Tranquility Base, the Eagle has landed.'" "The United States' headlong rush to the moon can only be understood within a Cold War context, Launius and other historians stress. The Soviet Union's two key space-race [successes] — launching the first satellite, Sputnik 1, in 1957, and putting the first person into orbit, in 1961 — spooked President Kennedy and other U.S. leaders. They saw in these achievements a grave threat to American technological superiority, and to national and global security."